One of the major issues that managers and corporations face is not having a clear idea of how much their staffs are working. Are you overworking them? Are they mostly unoccupied? Keeping track of your resource capacity utilisation percentage will allow you allocate your tasks with balance. This post will explain how Ganttic’s utilisation feature works and the best methods to use it. There are two places where the utilisation feature is visible. 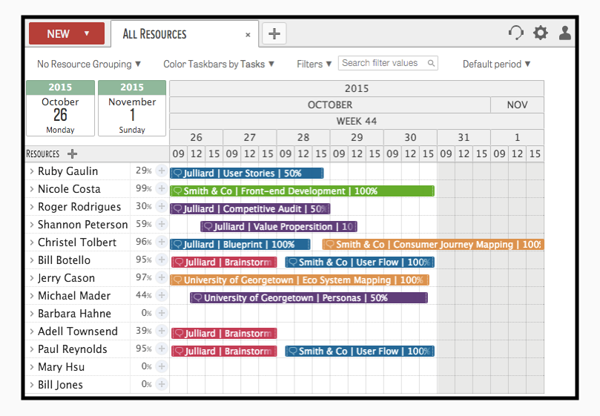 The first place is directly to each resources’ right - there’s a percentage which shows you the percentage of time that a resource is scheduled to work in the duration of the timeline. In the case of the screenshot above, the percentage is calculated from 26 October 2015 to 1 November 2015, from 9am to 5pm on weekdays. Business hours and business days can be set under general settings, the utilisation feature will take it into account and calculate accordingly. The second place the utilisation feature is visible is beside the tasks. You might have notice that some of them say 50%, some say 100%. For the tasks that only have 50% utilisation duration, they are only estimated to work 50% of the total amount of business hours in all business days. The tasks with 100% utilisation duration are estimated to run for the maximum amount of time scheduled. The total amount of each task's utilisation duration in any set timeframe are then calculated and shown beside each resource. E.g: From 26 October 2015 12nn to 30 October 2015 3:30pm, there are a total of 99 hours and 30 minutes. E.g: From 26 October 2015 12nn to 30 October 2015 3:30pm, there are 35 hours and 30 minutes of business hours in business days. Busy time - This is where you can set your utilisation duration estimation, either in the form of hours and minutes or percentage. E.g: 100% of busy time equals 100% of work time. If you update this task’s busy time to 50%, the hours and minutes will automatically update to 17 hours and 45 minutes. Used time - This is where you update the actual duration that the task was worked on. Not everybody will use this if their resources are not billed by the hour or they simple don’t need to keep track of hours used. E.g: The task might actually only end up taking 16 hours and 30 minutes to finish and you can update ‘Used time’ for future reference or for reporting. After updating in the task dialog, click save. Both the utilisation percentages beside resources and in tasks will update themselves. 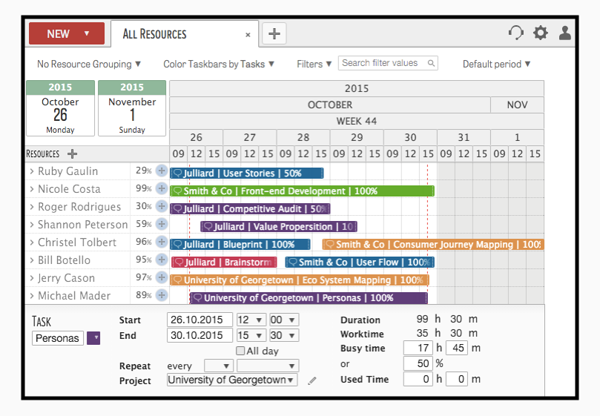 Task visuals are able to provide a general idea of whether a resource is busy or not. Capacity utilisation percentages are able to tell you exactly how much time has been taken up and how much more is left. Not only does this help your organisation determine the productivity situation, but also prevents imbalanced task delegation. To give capacity utilisation a try yourself, sign up for Ganttic here. In the next resource planning best practices post, we will look into how to generate report using all these data such as capacity utilisation information, task data and so on.